30 years now, we've been coloring this calendar. My brother brought it home from Kindergarten just about that long ago and we've re-created it if we didn't have a Kindergartener in the family. 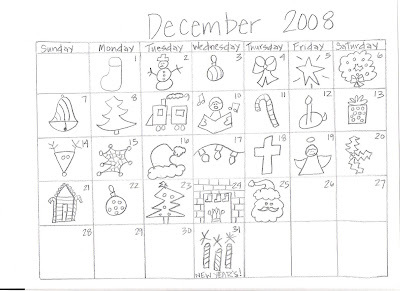 Now, I draw it for our kids each year. If you'd like one via jpeg or mail, just email me and let me know! Enjoy! Oh, and no comments on my artwork. It's a struggle each year! Interesting thing about calendars.....not every year starts on the same day. Thus, the fresh artwork every year. They covered this in the 1st grade, I think. Assuming your wonderment is due to envy and admiration of these fine skills I posess.